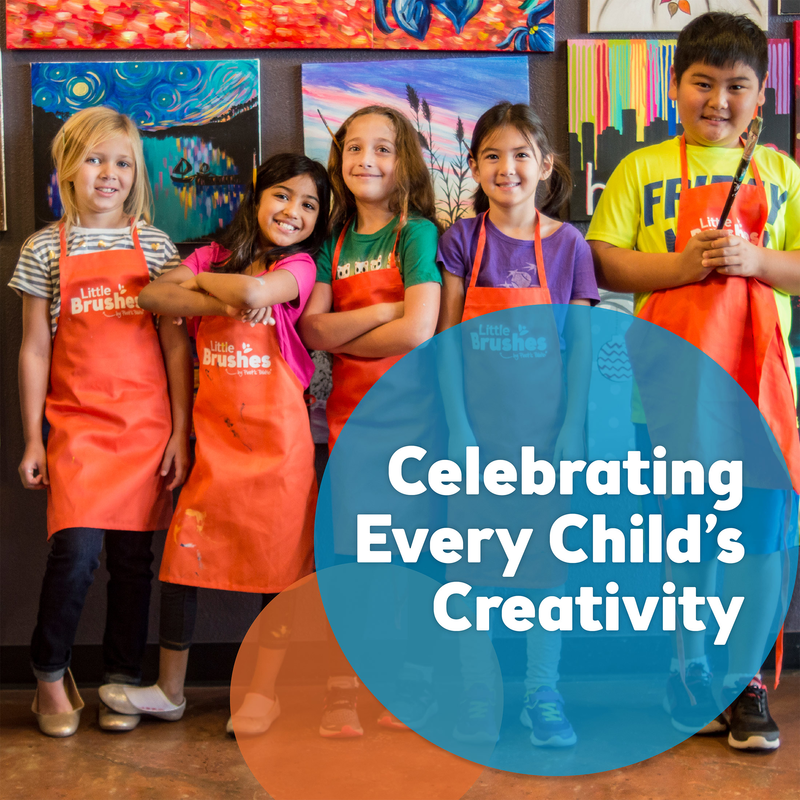 Our School Field Trips, Home School, Summer Enrichment Programs and Little Brushes Kids Art Camps for ages 5 to 12 are designed to bring out the inner artist in your child! Our events include not only canvas paintings but other fun projects as well, including t-shirt decorating, mosaics, flower pot project, print making, collages, puzzle design, and so much more!!! Q: What ages can attend the School Field Trips, Summer Enrichment & Little Brushes Kid Art camps? A: Ages 5 to 12 are welcome. Parents also can paint with their child for an additional fee. Q: Who will be teaching our Children's art events? A: The instructors for our Kids Camp and related programs are all experienced artists and are trained to lead children’s art classes. Q: What does my "Little Brush" need to bring? A: We'll be providing all of the necessary art supplies for the camp. Your child just needs to bring snacks & a sack lunch each day. Q: What should my "Little Brush" wear to an Art event? A: We will provide aprons, but please be sure to dress your child in comfortable clothes that are ok to get messy - just in case. A: Pricing varies per group. Our Individual pricing per child is $35 per 2.5 hour camp session, using 12x16 canvas board. See links below for more details. We do offer special pricing for schools and non-profit organizations. Q: Where are our Kids art events held? A: Our Little Brushes Kids events are held at our Pleasant Ridge West Shopping Center studio at the intersection of Cantrell Road and Pleasant Ridge Road in Little Rock. The address is 11610 Pleasant Ridge Rd, Ste 101. Q: Can parents stay and watch their child paint? A: No observers are allowed during any of our art sessions. However, if parents wish to paint along with their child, they can do so for an additional $10 per day, if they purchase the 5-day package for their child. Q: What is the Refund and Cancellation Policy for the Little Brushes camp. A: For cancellations that occur at least 2 days in advance (no matter when the Reservations was made), we will issue a reschedule credit for use within 60 calendar days of issue. In General, our kids camps are NOT eligible for refunds of any sort, due to the expense involved in planning and scheduling these events. A: Call us at 501.588. 1661 or email us at LittleRock@pinotspalette.com and we will be more than happy to answer any other questions!